Ozeki VoIP SIP SDK gives you the opportunity to exploit social networks like Facebook by making it possible to integrate VoIP functions. In this article you can learn how to reach clients on Facebook using superior webphone technology provided by Ozeki SIP SDK. The effectiveness of call centers can be measured by the amount of people they can connect with. It means that call centers can provide support for as many incoming connection types as possible. A successful company's call center can be reached by using a traditional telephone, an IP phone set, a softphone or even a webphone client. As Facebook provides the possibility to integrate your own application into your profile, you can use even your own webphone solution on Facebook, too. It means that you can create a webphone with Ozeki SIP SDK that can call your company's call center and put it on the company's profile page on Facebook. 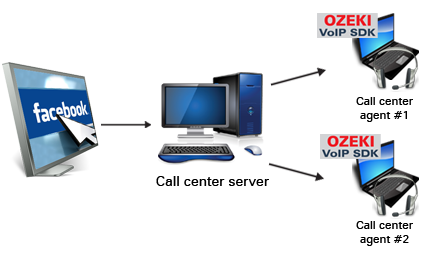 Ozeki VoIP SIP SDK provides the remarkable support for creating a VoIP webphone that can call a call center. Additionally, you can even build your whole call center with the help of Ozeki VoIP SIP SDK. The greatest advantage of Ozeki SIP SDK is that it is able to provide all the necessary tools and background for setting up an entire VoIP system including softphones, webphones, call centers, etc. Facebook applications can be easily used for reaching more people, especially for letting people call your company call center. For this purpose, you only need to create a webphone application on Facebook that can connect to your call center. For creating a Facebook application, you can use different methods. First of all you will need to validate your Facebook account with your phone or Visa number, then you will be able to create applications. Webphone applications can be defined on Facebook by using two application types, the Canvas and the Web application. Both can be used with Flash and Silverlight solutions, and if you want to reach the most customers it is suggested to use both. When you want to reach a call center from a Facebook application, the best way is to create a click to call solution that will use a SIP account but can only call one phone number. You can, of course use the simple solutions of fully featured softphone applications and give the call center number to the customers who install the application. Whatever Facebook application you create the most important thing is to run the server on a public address where the clients can reach it. When a client connects, they can call the call center server as they used any other solution, but in this case they call you from a Fecebook site. Facebook provides hosting service for your applications, but in the case of a call center, it is suggested to use your own hosting services for this purpose. When you have created the webphone application, you need to make sure that the server runs as the webphone will use that to connect to your call center.